The simple sleeveless long maxi dresses with a solid colors and casual style designs,AAMILIFE&Here Curvy caters to every corner of your wardrobe - think chic, wearable styles set to take you from desk to date night and everything in-between. *Fashion mix: you can wear with beach hat,sunglasses,pretty necklace,and can wear either flats or heels. 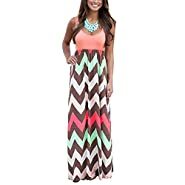 *M(US 8-10): Bust:33.8",Length(shoulder to hem)55.5"
Long dresses features: casual and higher waist line with side pockets, sleeveless,rounded neckline and racerback, long length, loose fit and solid/plain color This women maxi dresses style is casual loose, perfect to wear with a belt,necklace and heels Occasion: suitable for summer, beach, weeding, party, club, daily or work. Size/Color: Small(US 4-6), Medium(US 8-10), Large(US 12-14), X-Large(US 16-18)/DeepGreen, Navy blue, Burgundy Dresses care: Hand-wash and Dry Clean,Do not bleach.